Sitting in the airport in Kigali last week I was thinking how quickly the time had passed and how on earth was I going to relate all the things which had happened during the previous three months. There has been great joy and excitement; some surprises some real achievements and many frustrations. I plan to send three newsletters fairly quickly and name them after the months I have missed, so here goes. First I want to say a huge thank you to our three volunteers. Karen has been working with us since September and doing a marvellous job helping the teachers with English, maths, science and play activities in the nursery. Sadly she left us late March but has promised to be back! Here she is being presented with flowers on her leaving day. We know she will be telling the folks in Denver, Colarado all about us. Chris spent two months with us helping the co-operative with their business plans and visiting places to find clients for the things they make. 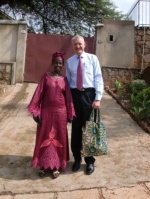 Here he is with Mary on the way to make contacts in Kigali. We no longer do our training classes but are concentrating on trying to get the business up and running as that people can use their skills to earn money. The people are experimenting with new products but still need a lot of support while they establish themselves. 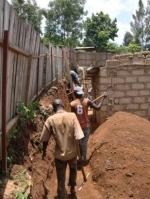 We will soon need the rooms where they work for classrooms as the school expands. Chris has also done an amazing job in organising the student records and other office paperwork – very much needed! And this is another Karen – or Karen Kabiri (Kinyarwanda for 2) as she has become known. Karen is a student from Belgium and she is doing a 5 month placement with us and part of her post-graduate studies. 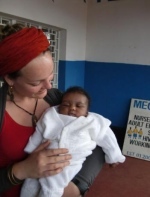 She will be working alongside the Rwandan staff mainly in the nursery, developing play activities. She is also a keen footballer and will be playing with the women’s football team. She is holding one of our surprises. On February 3rd, Tamar was at work in the morning. At lunchtime she went home but felt unwell so she walked to the hospital to be told she was going to deliver her baby immediately – we had not expected her for another three weeks at least. She returned to work after only three weeks and brought Queen Marie-Paul to meet us all just before I left in late March. Her husband Jean-Paul is chief of the local village and helps us with the building work. They are a lovely family, their eldest son recently left for secondary school and they immediately took in an orphan to live with them. They help so many people, including Pauline, who I wrote about in one of the first newsletters. She is now doing really well at school, is safe and secure in a loving family. For me, my time has been very largely taken up with dealing with various officials trying to get our papers in order and our registration finally completed. Most major hurdles are over now, there are a couple more things to do when I get back, but we are almost there. Our building plans had to be changed due to adverse weather circumstances. The toilets are completed now and are ready to be used at the beginning of next term. We had to build a composting station at the local garden centre but now all should go well. We renovated and established another classroom, so that Nursery 3 could be in a room and not on the terrace. We had a wonderful response from donors who wanted to help us build the kitchen and we planned to build our kitchen this time. However, there were very heavy rains over an unusually long period – Rwanda too is experiencing changing weather patterns. Kigali saw some catastrophic rainstorms, resulting in collapsing houses and serious damage. We decided that we would have to build a retaining wall around the back of the property to try to prevent erosion damage and muddy torrents swamping us. A huge job, but with hindsight, although we do not yet have our kitchen, it will be better in the long run as the site is secure now. Finally, some really good news. I went to see the Commissioner General of Police. I explained who we were and that we were his neighbours. I told him we were short of space to play and he agreed that we could use some police land behind our house as a play area. This will make a huge difference to us and we are very grateful. All for now – the next instalment will arrive shortly. As always, I wish you peace and love – and my grateful thanks for your generosity in continuing to support us in difficult financial times. We cannot do it without you.